I've been thinking about this for a while now, "what in my life is not serving me?" I've come up with an answer that I've wrestled with ever since its discovery, so I wonder if I can ease into the 'letting go' process. When I did my 30 days of 'no drinking' challenge in August, I was surprised how easy it was, so could I give up (dun dun dun!!!) TV for 30 days? But then I was plagued with another thought - what is 30 days anyway? Does it change anything in the long run? I mean, I'm drinking a glass of wine right now... I'm going to say "no" for me. I'm skipping the 30 days on this one, and saying goodbye forever! I've decided to sell my TV. It's just not serving me anymore. I will miss it like any bad habit or relationship. I will mourn the hours and hours of time we spent together. I always had my TV to turn to when my friends were with their significant others, or I was sad and needed a pick-me-up, or I just got off work and was really tired and all I could do was put my comfy pants on and sit on my couch, and think, "I'm so happy right now." Some of my favorite nights were in front of the TV with Prosecco, pizza, popcorn, and if Dancing With the Stars was on, I was in heaven. Ha, those were the nights. Some days I would look down on myself and say, "I need to stop this time-sucking behavior; it's not the way I want to live." Apparently I'm not alone, because the average American watches 5 hours of Television a day. That's 35 hours a week. That's just about where I'm at. Man, what I could do with an extra 35 hours. Wait, what would I do?....Well, I want to learn Italian, take more design classes, take salsa lessons, travel more, read, listen to more positive podcasts, and go to bed earlier. I'm thinking with an extra 35 hours a week I can start checking things off my list. Yesterday it started to become real; I cancelled my Netflix and Hulu accounts. This morning I cancelled my cable. With my extra time not binge watching DWTS, I did the math - I will be saving $1427.76 a year! I guess I will have the money for those salsa lessons after all; there goes that excuse! I feel a tightening in my chest just knowing that in a few days, I'll be coming home, and my TV will be gone...gone! The person coming to buy it will be here, hauling it out of my home, and I imagine myself saying, "You better take care of it or I'll kill you! That's my best friend you're holding onto there, be careful!" Ugh! How can I handle this? Ok, ok, just make a list of all the things I want to do, and make a plan...We all saw Silver Linings Playbook! I need to have a plan in place! Oh, who am I kidding, I don't know what's going to happen; all I know is that I tell my organizing clients all the time that they should get rid of what's not serving them anymore. Now I'm taking my own advice. I feel the resistance with them in the beginning, and I feel the resistance within me now. How can I give advice if I'm not willing to take it myself? Silver lining...is when I see the success in their lives unfold, and they tell me how much their situation has improved since they were able to rid themselves of the things that were holding them back. If you're still reading this, and haven't labeled me 'crazy' for rejecting the entertainment rectangle, I challenge you to take a look around your space, and see what is it that is not serving you. Whether it's a TV, old textbooks, or even a job or a relationship, if it doesn't serve you anymore, take the leap and let go. And after, if you experience regret or enlightenment, then feel free to email me... I'll have plenty of time on my hands to answer you back. Happy Halloween! With the holiday season creeping up on us, it is the perfect time to get organized. Most of the time we start with the closets, usually thinking about our clothes, but what about that cold closet in the kitchen? You know, where you store the perishable and the perished things, the things that spend most of their time in the dark, until you open the door to gobble and guzzle? Of course, I'm talking about your refrigerator. We know how it goes - cartons, condiments, and containers full of sometimes-scary-stuff get pushed back on those shelves so deep that they may never see the light of day for months. I remember house sitting for my mom when she would holiday in Italy for a few weeks, or even just for a weekend in upstate New York. Right after the hug good-bye, the first thing I would do is clean out her fridge. I would get excited because, for me, the messier it was, the more fun it was to organize! As I think back on those times, I realize more and more that it has always been my calling to be a Professional Organizer. Anyway, I could never understand why there was always so much food in her fridge; who was going to eat it? And when? With only her and her husband living in the house, when would they possibly consume a full pound of grated parmesan cheese? And was that mold? Why, yes it was. So the answer to that question was...never. Ok, ok, my mom would be upset if I kept talking about her moldy cheese, so let's talk about how you can get your fridge ready for all the good eats coming your way for Thanksgiving. The best way to start any organizing job is to take everything out first, so go ahead and empty that fridge. As you are removing all the perishables, begin to put like items with like items: all your condiments together, vegetables, sweets, sodas/drinks, leftovers etc. While you are doing this, check all the expiration dates. Every time I'm helping a client, we find a handful of condiments that are way past their expiration date; it's just something you don't tend to think about. Have a garbage bag handy, and start throwing out anything that has seen better days. If you can recycle any bottles and packaging, please do :). That is the first step, and you will find your contents slimming down. Next is the leftovers. We all start with good intentions. None of us like throwing food away, so we put the leftovers in tupperware for the next few days... and often never eat it... sometimes it even gets pushed to the back of the shelf, and by the time we open it again, we can't even recognize what it once was! The rule of thumb with food is, "when in doubt throw it out." For me, the best leftover solution is this: after I make a nice meal, I portion out the leftovers into one-cup plastic containers and freeze them. This way I'm not eating the same thing for 3 days in a row, and when I need a quick meal, I have something ready to go. Finally, toss anything that you know you and your family are not going to eat. Maybe you were on a diet last week and now won't go near that cottage cheese, or your kids wanted to try the latest fruit drink but they didn't like it. Go ahead and get rid of it; it will eventually go bad, and since you won't consume it, why wait? Also, make sure to check for flat sodas, old wine, bad juices, and anything else that hasn't been tasted in a while. When you put everything back, add some organization. 1 - Keep all condiments on the door or use a lazy susan. 2 - Keep like items together; cheeses, sweet stuff, yogurts, etc. Use these bins to help keep these similar items together. I also like to keep my wines, olives and mixers on the bottom shelf on the door, or you can use these holders for wine. 3 - Pick one day a week to do a quick scan of the items in your fridge, and throw out anything that is about to go bad. Preferably, do the scan right before you go food shopping, so things don't get out of hand. 4 - If you have leftovers, try to write the date on it with an erasable marker, a marker with masking tape, or these labels, so you don't have to remember when you stored it. You have three weeks before Thanksgiving. The countdown is on! See if you can set a few hours aside and clean out the fridge (and be ready for all those leftovers and pies). Happy Halloween and Happy Organizing! Last Tuesday I made the Los Angeles journey from Mid-City to Santa Monica for the Tiny Wardrobe Tour. 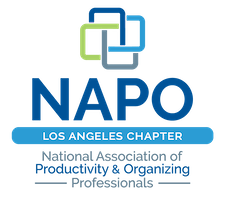 NAPO (National Association of Professional Organizers) Los Angeles Chapter was promoting the event, "Project 333: Be More with Less." that was featuring a minimalist fashion challenge created about six years ago by Courtney Carver, who was looking to simplify her life in every area - including her closet. I was pretty skeptical about this concept of living with a wardrobe of only 33 items for 3 months (Project 333, get it? ), which includes jewelry, accessories, and -gasp- shoes! I even felt justified in my quick judgement as the speaker approached the front of the room clad in a plain, white, v-neck tee and simple black skirt; I was thinking I would have wore something with more pizazz for the presentation. During part of her talk, Courtney mentioned that most people really don't care or notice what you wear, which in that moment, did not ring true for me - just earlier, as I was coming down from the parking garage, I got a complement on my shoes from the woman in the elevator. Not that I get dressed in the morning for compliments, but they're always welcomed, and my fellow lift companion certainly did notice what I was wearing, and was inspired enough to share with me. It also didn't help my willingness to embrace the presentation that there was a woman in the audience who was loudly and emphatically determined to be a minimalist; she was pushing desperately to get rid of everything in her home. The zealous-like energy and the extreme minimalist mentality upset me and put my guard up. For me, having nothing is just as bad as having too much. It is said that you shouldn't define yourself by how much you have, but I say don't define yourself by what little you have either. As Courtney was speaking I was stuck thinking, "This 33 thing just can't be possible." I work with a lot of clients that purge so much stuff, and are still left with way more than 33 items. I started tensing up as I imagined my own closet, and envisioned getting by with only 5 pairs of underwear and maybe 2 pairs of socks, to at least allow for some variety of shirts - or what if I went commando and just wore sandals?!? It came as a relief as she explained the project in more detail and revealed that sleepwear and workout clothes are each counted as one, and you don't include undergarments. Phew. As Courtney went deeper into her story, the tension knot between my shoulder blades eased, and I couldn't help but be inspired by the way her health and happiness had improved, how her family downsized from a house that was too big for them into renting a smaller and more functional unit, and how they are debt-free and she is earning a living by doing what she loves: teaching and inspiring people all over the world. And by now, she's right; I don't care that she is wearing a boring white tee. Courtney inspired me. After removing the pieces that did not serve me from my space, I am lighter and freer. I even took inventory of everything that remained. Since Courtney had encouraged us to tailor the project to fit our individual needs, I came up with this: if I group my shoes, outerwear and jewelry as one each, then I can get the number close to 33. Well...ok, maybe not that close, but certainly closer at only 74 items, and if I had a garage or basement to store my off-season pieces, then it would be more like 60 items. Courtney said 33 may not be the number for everyone; 60 is a doable number for me. Instead of dwindling down my wardrobe to 33 items, I actually got rid of 33 items, and it felt great! In the end what it comes down to is this: love yourself more, and love your stuff less, and always make room for new things to come into your life. Always make space for love.